My Mother, this Norman Rockwell painting, appeared on the cover of Life Magazine published December 19, 1918. An alternate title for this illustration is Soldier with French Woman. This was the fourteenth cover by Rockwell to appear on Life Magazine. A Rockwell painting appeared on Life magazine's cover a total of ten times in 1918 and twenty-eight times in all. The days and months immediately after World War One must have felt almost heavenly to both soldiers and civilians alike. Here we see a young American soldier and an older French woman. Implied in this painting is a relationship between them. Perhaps the woman's family has taken the soldier under their wing while he is still stationed in France. She is knitting, carrying on her duties and interests like she did before the war. Her life is steadily drifting back towards normal. The soldier has received mail from home. He has opened his letter. Inside is a photograph of his mother. He has obviously missed her as much as she has missed him. The name on the envelope is a familiar name for Rockwell enthusiasts. The soldier is Pvt. Sammy Smith. Pvt. 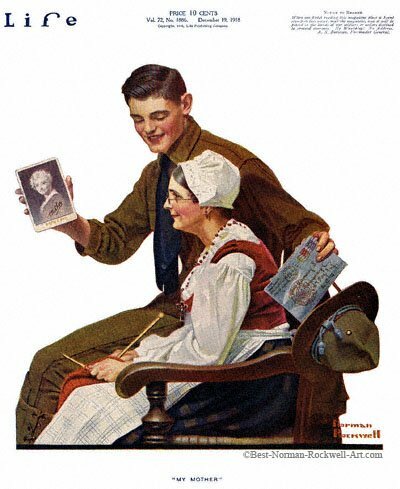 Smith has been identified in at least one other Rockwell painting, They Remembered Me from Leslie's December 22, 1917 cover.